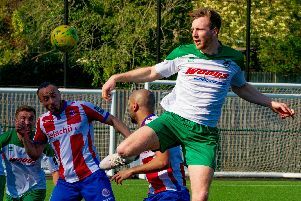 Broadbridge Heath featured a number of new and returning faces as they got their new season underway with a 1-1 draw against Hassocks at The Beacon. The Heath side included three players making their debut, Ben Hands, Glen Woodburn and Ben Chowney and two players making a welcome return to the club in Lee Carney and Mark Fox. Heath started brightly with Devon Fender going close with a right-foot shot that went across the face of goal and just wide of the left post, while Stuart Chester got up well to meet Jamie Robinson’s left-wing cross, but steered his header straight into the arms of Hassocks keeper Alex Harris. The home side’s first attempt came midway through the half when Spencer Slaughter won the ball on the halfway line and tried to lob Heath Mark Fox, but his effort sailed wide of the mark. Minutes later Hassocks striker Liam Benson found space 20 yards from goal to hit a shot just wide of the post. In the closing stages of the half, a Robinson free kick from the left was floated into the far post where Marlon Maxwell met the ball in his stride to fire a right-foot shot narrowly over the bar. The home-side started the second half strongly and Fox was called into action when a long ball from the left almost crept in at the far post but the Heath keeper just about managed to push it wide and Slaughter followed up with a right-foot shot with the outside of his boot that went wide of the post. Hassocks were almost caught out on the counter-attack when George Cousins whipped a ball in from the right which struck home defender Dan Webster as he was running back and the ball flew off him towards goal, but somehow Harris managed to react quickly enough to make a fantastic acrobatic save to deny the Bears. With 20 minutes remaining a home player broke away down the right and took the ball to the goal-line before he cut it back to Jack Wilkins who was brought down 12 yards from goal by Maxwell and Benson got up to score from the resulting penalty. Heath continued to push forward in search of an equaliser and were rewarded when Fender received the ball wide on the right. Last season’s top scorer ran at the home defence, skipped past a couple of challenges before he hammered a left foot shot that flew past Harris into the net. With the players tiring in the heat of the day, both sides continued to push forward in search of the win. Cousins, Fender and Chester all had shots narrowly wide but probably the easiest chance of the game came for Hassocks in the 87th minute when Benson took the ball wide on the left and played it into the path of Alex Spinks some 12 yards from goal but the midfield player fired wide with the goal at his mercy. Heath: Fox, S.Chester (Chowney 87), Robinson, Maxwell, Woodburn, Carney, Bold, Weller, Fender, Cousins, Hands (Godfrey 75).